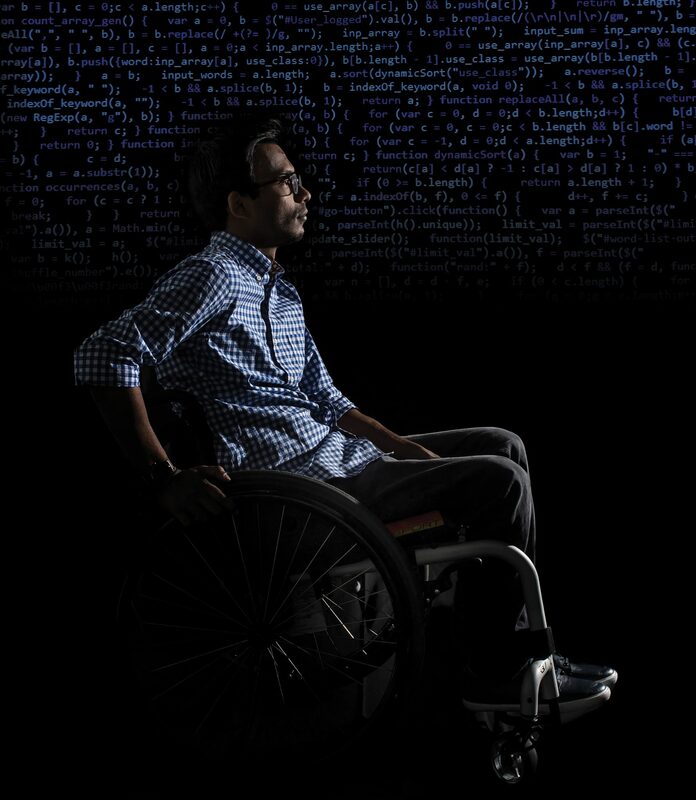 Turning his disability into inspiration, computer science ace Ather Sharif is transforming the web experience for differently abled people. If I don’t do myself the favor of getting back to life, it’s never going to happen,” Ather Sharif ’16 (M.S.) grumbled one morning in 2014. A frightened 23-year-old, thousands of miles away from his family in Pakistan and wrenched from his graduate school friends in North Dakota, Sharif had suddenly found himself in Philadelphia at Magee Rehabilitation Hospital after a life-altering car accident in March 2013. As he learned to live as a quadriplegic, he was — not surprisingly — feeling sorry for himself. “I had gotten to the point where I thought I would never achieve anything ever again,” Sharif, now 27, continues. “I was afraid I’d have to depend on other people for the rest of my life.” But on that fateful morning, a year after the accident, his innate independence emerged and he made a decision to enroll at Saint Joseph’s University. He would, he declared, get moving and complete the computer science degree that he started after relocating from Pakistan to attend the University of North Dakota. He knew it wouldn’t be easy, but he had no idea how fortuitous the next two years would be. While researching his master’s thesis at SJU, he began considering ways in which people with vision loss might more fully experience the richness of the web. In particular, he focused on creating a free plug-in that would allow screen readers (assisted technology that provides speech synthesizers or braille displays) to extract the crux of graphs, bar charts, and pie charts and explain them in greater detail — offering context, rather than just reading them in rote fashion. In 2015, his efforts earned him IBM’s People with Disabilities Award and a $10,000 Google Lime Scholarship. Also that year, he won “Geek of the Year” at the Philly Geek Awards. “I’ve always wanted to get an award for being a geek and be respected for it at the same time,” he says. Of course, Sharif had come to understand personally just how difficult it can be for the differently abled to navigate the web. is nothing new for Sharif, who even as a teenager exhibited an entrepreneurial bent by taking on freelance programming gigs in Pakistan. He attributes much of his success to the support he’s always enjoyed — first from his family, then at SJU. That applies to EvoXLabs, where he’s constantly drumming up new partnerships and applied research; to Comcast, where he’s worked since graduation as a full-time software engineer; and to his own future, as he prepares to pursue a Ph.D. in human-computer interaction at the University of Washington. Greco is a freelance writer.